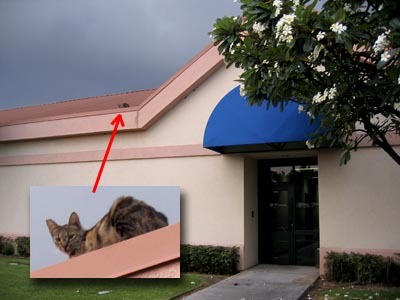 Our parking lot is overrun by feral cats and now it looks like they’re taking over the building too. We have some cats in the ceiling, too. Have you noticed the broken ceiling pannels in the office? Something (must have been a cat) crashed into Gloria's office about a month ago, and this week we saw one break a pannel above Ilona's desk. That is so gross. I was always scared they were going to urinate in my Jeep. Gross!! !